Is there a way to "mark all as read" in Skype for Business on Mac OS X? I'm running Skype version 16.5.185. The only solution I've found it to find mark as read under the Conversations menu, but the option does not exist under that or any other menu. What if you rightclick the group where these messages/conversations are? Here's a guide but doesn't seem to show that exactly how to mark all as read, could be if they are grouped? In the sidebar, the Recent section lists new contact requests, unread conversations and conversations you've had in the last 12 hours (you can change how long chats stay in the Recent section in your settings). Click the contact or group you want to see the conversation history for. Thanks for trying to help. Unfortunately, right-clicking a group doesn't give a Mark as Read option. With a group selected, I can't find the option under any menu group; not even grayed-out. I think the feature is missing from Skype for Mac. 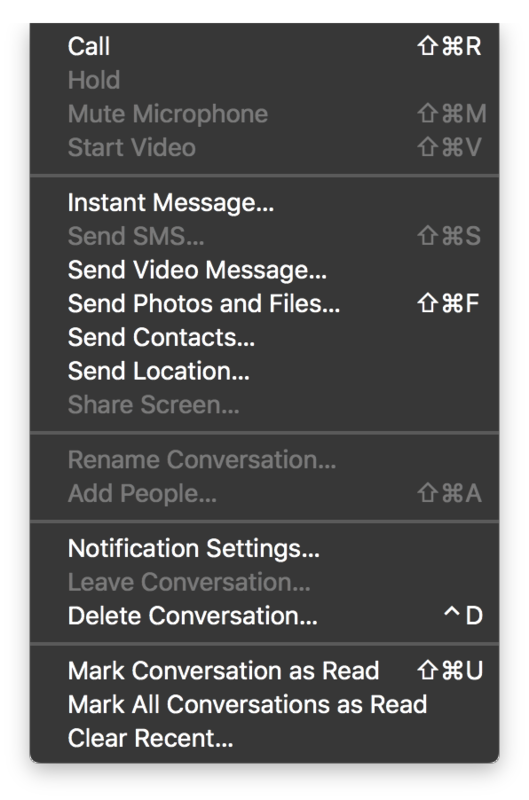 I don't know which OS X version you have, but you should be able to Create a keyboard shortcut for Skype in System Preferences --> Keyboard --> Shortcuts --> App Shortcuts, and use that to Mark all Conversations as Read, without having to go to the menu. There is an existing keyboard shortcut to mark individual conversations as read. The option to Mark All As Read does not exist in Skype for Business, so I can't create a shortcut for it. There does not appear to be a solution to this issue.